"You'll really enjoy this tasty snack that's highlighted with the popular flavor of ranch dressing." In large microwaveable bowl, microwave butter uncovered on High about 30 seconds or until melted. Stir in cereal, pretzels and crackers until evenly coated. Stir in dressing mix and cheese until evenly coated. Microwave uncovered on High 3 minutes, stirring each minute. Spread on waxed paper or foil to cool, about 15 minutes. Store in airtight container. I tried this a couple of times. The ranch mix really didn't distribute too well. 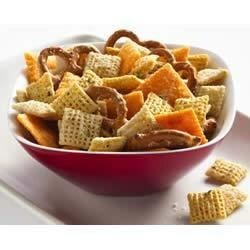 I prefer the original Chex Mix--still my favorite. This recipes is always a hit at my house. I use Hot and Spicy Cheez It for some add zip.